We've been a fan of the dashbroad approach for a long time because dashboard graphics can give readers a quick snapshot of multiple sets of dynamic data. Charley Kyd, who studied journalism some years back, has developed a nifty plug-and-play package — Dashbroad Kit #1 — to generate these. And below is a recent and relevant posting from Jorge Camoes that gives us some good tips on the topic. Excel is a great (but underrated) BI tool. Several BI vendors gave up fighting it and offer Excel add-ins as front-ends for their BI solutions. So, if you want to create a dashboard you should consider Excel, since it really offers better functionalities than many other applications for a fraction of the cost and development time. I know that Excel is not a one-size-fits-all solution, but first you should be sure that your requirements are not met by Excel. Let me share with you some random tips from my experience with the Demographic Dashboard. But, shouldn’t I just ask my IT to create the dashboard? This is a fact: many IT departments hate Excel. The IT spends millions in BI solutions and users keep using Excel. Why? Because they know it, they like it, they feel in control and can do what ever they want with the data. Ask your BI manager to replicate the image above using an expensive BI solution and he’ll come back six month later with something you didn’t ask for, to answer a need you don’t have anymore (I know, I’m oversimplifying…). Do you know Master Foo Defines Enterprise Data? So, you have your idea for a dashboard, you’ve discuss the project it with the users (right?) and you are ready. But where to start? Remember this: a graph, a table, the entire dashboard, are merely instrumental to solve a business need. It’s about insights, not about data, not about design. Yes, I know, this is Excel, and it is supposed to have formulas. What I am telling you is that you should aim at minimizing the number of independent formulas, and this should be a fundamental constraint to your global strategy. Too often I see Excel used as a database application. It is not, it is a spreadsheet (not everyone finds this obvious). Over the years I had my share of “spreadsheet hell”: a lookup formula in the middle of nowhere would reference a wrong range for no apparent reason. An update cycle adds a new column and suddenly there are errors all over the place. You leave the project for a week and when you come back you don’t know what all those formulas mean. Even if everything goes smoothly the auditing dep wants to trace every single result. But how do you minimize the use of formulas? If your data table resides in an Excel sheet you’ll have to rely heavily on lookup formulas, and that’s one of the highways to spreadsheet hell. Instead, get the data from an external source (access, OLAP cube…) and bring data into Excel. Calculations should be performed at the source. After removing all the formulas you can, the remaining should be as clear as possible. 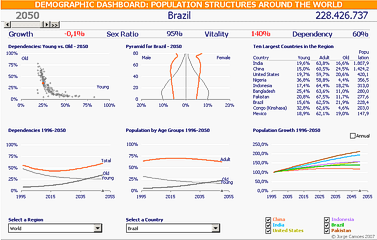 Every object (graph, table) in the Demographic Dashboard is linked to a pivot table. Let me give you an example. One of the charts shows population growth over the years, using 1996 as reference. Pivot tables can calculate that directly, I don’t need to add a new layer of complexity by using formulas (to calculate the actual values and look up formulas to get them). The population table has 200,000 records, so I coundn’d fit into the Excel limit of 65 thousand rows (yes, that’s changed in Excel 2007, but it is debatable if a table with a million rows in a spreadsheet application can be considered good practice). By using a pivot table I can overcome that limit. To be able to use self-document formulas (”=sales-costs” is much simpler to understand than “=$D$42-$F$55″) is one of several uses of named ranges. But they are also the building blocks of interaction with the user and they make your Excel dashboard more robust. You don’t have to pay for each additional sheet you use in a workbook, so use as many as you need. Each cell in your dashboard report sheet should point to some other sheet where you actually perform the calculations. You should have at least three groups of sheets: a sheet with the dashboard report itself, sheets with the base data and other group with supporting data, definitions, parameters, etc. Add also a glossary sheet and a help sheet. Once you know what you need, start playing with the dashboard sheet. Use autoshapes to test alternative layouts or, better yet, use real objects (charts, tables…) linked to some dummy data. There are two ways to wow your users: by designing a dashboard that actually answer needs, or by planting gauges and pie charts all over the place (this one can guarantee you a promotion in some dubious workplaces, but it will not help you in the long run). In the series on Xcelsius Dashboards you can see how difficult is to create something beyond the most basic and irrelevant charts. So, get rid of Excel defaults (take a look at this before/after example) and just try to make your dashboard as clean and clear as possible. You’ll find many tips around here to improve your charts, so I’ll not repeat myself. 8. Do you really need that extra-large chart? Charts are usually larger than they should. What it really matters in a chart is the pattern, not the individual values, and that can be seen even with a very small chart. A dashboard is not an exploratory tool, is something that should give you a clear picture of what is going on. But I believe that at least a basic level of interactions should be provided. User like to play with the tools and can they learn a lot more than just looking at some static image. Please, please, structure and document your workbook. Excel is a very flexible environment, but with flexibility comes responsibility… I am not a very organized person myself, but from time to time I try the tourist point of view: I pretend I never saw that file in my life and I’ll try to understand it. If I can’t or takes me too long, either I must redesign it or write a document that explains the basic structure and flow. Once you have a prototype, user will come up with new ideas. Some of them can be implemented, others will ruin your project and if you accept them you’ll have to restart from scratch. So, make sure the specifications are understood and approved and the consequences of a radical change are clear. This is far too incomplete, but I’ll try to improve it. Will you help? Do you have good tips specific to the design of Excel dashboards? Please share them in the comments.